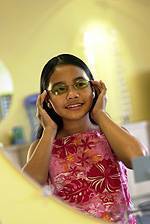 When buying a pair of eyeglasses for your child bring them along. Your child should like how the glasses look and feel. At TSO Ingram, we carry a wide selection of children’s frames including designer frames Nike, RayBan, Hello Kitty, Crocs, Floats, Disney and Timberland.